Glucose enters the cell. It is phosphorylated by the enzyme hexokinase. This enzyme transfers a phosphate group from ATP to the glucose to form glucose-6- phosphate. The plasma membrane is impermeable to ions. So the electrical charge of the phosphate group traps the sugar in the cell. Phosphorylation of glucose also makes the molecule more chemically reactive. Glucose 6-phosphate is rearranged. It is converted it to its isomer, fructose 6- phosphate. In this step, another molecule of ATP is used in glycolysis. An enzyme transfers a phosphate group from ATP to the sugar. It forms fructose–116- diphosphate. fructose1-6- diphosphate into two different • three- carbon sugars: glyceraldehydes-3-phosphate and dihydroxyacetone phosphate. These two sugars are isomers of each other. Another enzyme catalyzes the reversible conversion between the two three—carbon sugars. It converts all the molecules of dihydroxyacetone phosphate into glyceraldehydes-3-phosphate. 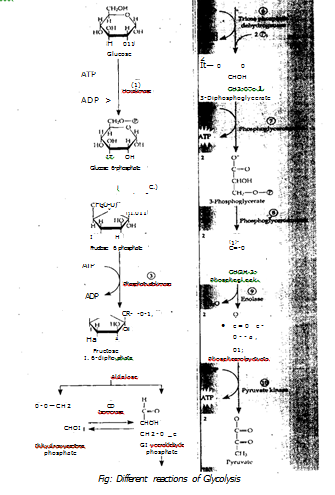 The next enzyme in glycolysis uses only glyceraldehyde phosphate as its substrate. An enzyme now catalyzes two • reactions. First, the sugar is oxidized by the transfer of electrons and H+ to NAD. It forms NADH+. This reaction is very exergonic (-10.3 kcal/mol). The enzyme uses this energy to attach a phosphate group to the oxidized substrate. It forms 1,3-diphosphoglyceric acid. The source of the phosphate is inorganic phosphate. It is always present in the cytosol. Finally glycolysis produces some ATP. The phosphate group added in the previs us step is transferred to ADP. It forms 3-phosphoglyCeric acid. This compound is not a sugar. Next, an enzyme relocates the remaining phosphate group to form 2-phos hoglyceric acid. This prepares the substrate for the next reaction. An zyme removes a water molecule from 2-phosphoglyceric acid and form a dou le bond in the substrate. It forms phosphoenol pyruvate, or PEP. This mak s the substrate very unstable. The ast reaction transfers the phosphate group from PEP to ADP. So it produces mon ATP. Since this step occurs twice for each glucose molecule, so there is a net’am n of two ATP molecules. in the meantime, glucose has been broken down and oxidized to twb molecules of pyruvate. It is the end-product of the glycolytic pat way. Gly olysis is an inefficient method of harvesting energy. But it still persists. One rea on is that evolution is a slow process. 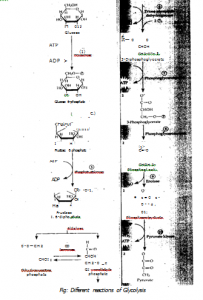 When glycolysis first evolved, it had an ad ntage. Oxygen was absent in the early atmosphere of the earth. Glycolysis tak s place without oxygen. Thus only organisms performing glycolysis survived in t e early life on earth. Later evolutionary changes took place in catabolism. But gly olysis was not discarded during this.building process. Rather, it was used as a se for the evolution of another process. This process is aerobic respiration. It co pletes breakdown of glucose. Evolution added another layer of chemical reactions. This reaction is aerobic respiration. It comes on the foundation layer (glycolysis). It has produced an efficient method of harvesting energy. Therefore, all forms of animal life carry on glycolysis within their cells. Thus glycolysis is a metabolic memory of an evolutionary past. T e flow of energy through cells involves the transfer of electrons from one molecule to another. This electron transfer is called an oxidation-reduction • reaction, or redox reaction. Oxidation reduction reactions always occur together. Oxidation: The molecule that gives up electrons is oxidized. Thus, oxidation is the loss of electrons. It is an evolutionary bypass. Some organisms use to keep glycolysis functioning under anaerobic conditions. .
t is a biochemical remnant. It has evolved very early in the history of life At hat time the earth’s atmosphere contained no oxygen. Strong evidences are present. These evidence shows that the common descent of rganisms from primitive cells. In these cells glycolysis and fermentation first ap. -ared. It still persists. 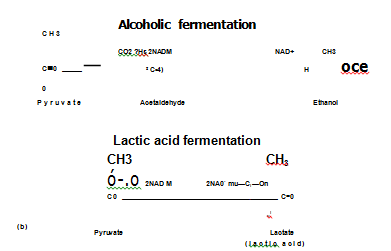 The NADH reduces the Pyruvate to form lactic acid: This reaction occurs in the ani al cell in the absence of oxygen. The NADH reduces the pyruvate into alcohol. It takes place in some fungi and bacteria. The glucose is not completely degraded during fermentation. So considerable unusable energy still remains in the products. Only two molecules of ATP are formed during glycolysis and no more ATP is produced. Fermentation is used only to regenerate NAD. (a) Obligative anaerobic: Obligative anaerobic organisms include certain types of bacteria. These organisms survive only in the complete absence of molecular oxygen. include certain bacteria, yeasts, and cells. These organisms can ferment nutrients in absence of oxygen. It also generates some ATP. It also provides NAD for glycolysis. Facultative anaerobic organisms and tissues carry out more efficient energy harvesting in the presence of oxygen.